Everyone knows this kind of politician: a charismatic maverick who goes up against the system and its ways, but thinks he doesn't have to live by the rules. Using his experience as a speechwriter, Barton Swaim tells the story of a band of believers who attach themselves to this sort of ambitious narcissist-what makes them invest in these leaders, how these leaders do provide moments of inspiration, and then how they let them down. 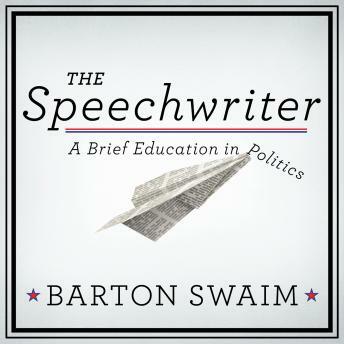 The Speechwriter is a funny and candid introduction to the world of politics, where press statements are purposefully nonsensical, grammatical errors are intentional, and better copy means more words. Through his three years in the office of a controversial governor, Swaim paints a portrait of a man so principled he'd rather sweat than use state money to pay for air conditioning, so oblivious he'd wear the same stained shirt for two weeks, so egotistical he'd belittle his staffers to make himself feel better, and so self-absorbed he never once apologized to his staff for making his administration the laughing stock of the country. On the surface, this is the story of South Carolina governor Mark Sanford's rise and fall. But in the end, it's an account of the very human staffers who go into politics out of conviction and learn to survive a broken heart.